Last updated on: June 12, 2012. 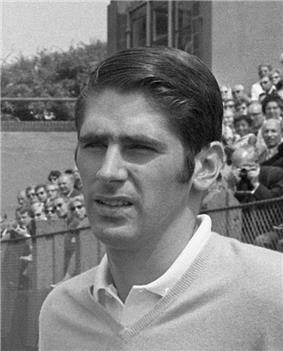 Marty Riessen (born December 4, 1941) played amateur and professional tennis in the 1960s and 1970s. He was ranked as high as No. 11 in the world in singles on the ATP Rankings in September 1974, though was ranked as high as World No. 8 by Lance Tingay of The Daily Telegraph in 1971, before the computer rankings. Renowned for his doubles play, Riessen was also a regular doubles partner of Australian tennis great Margaret Court, winning six of his seven major mixed titles and a career grand slam alongside her. Additionally a winner of two men's doubles grand slams, his highest doubles ranking was No. 3 on March 3, 1980. Marty Riessen played collegiate tennis at Northwestern University, where he reached the NCAA Singles finals three times: 1962 (falling to Rafael Osuna of USC); 1963 and 1964 (falling to Dennis Ralston of USC both times). He was a semifinalist at the NCAA doubles championship with Clark Graebner in 1963 and 1964. He won six singles titles in the open era, with the biggest coming in Cincinnati in 1974. (He won numerous other pre-open era titles, including two other Cincinnati titles in the pre-Open Era.) He also reached the quarterfinals in singles at both the Australian Open and the US Open in 1971. He also won 53 doubles titles, including the US Open (in 1976), the French Open (1971, with Arthur Ashe), and seven ATP Masters Series events: Paris Indoor (1976), Canada (1971 & 1970), Monte Carlo (1970), Hamburg (1968 & 1969), and Rome (1968). He reached the doubles final at US Open in 1978 & 1975, the Australian Open in 1971, and Wimbledon in 1969. He was a member of the U.S. Davis Cup team in 1963, '65, '67, '73 and '81. The Marty Riessen tennis courts are in Osmond, Nebraska. Dunlop named one of its wooden racquets the "Marty Riessen." Riessen has been enshrined in the United States Tennis Association/Midwest Hall of Fame. He is one of two high school tennis players from the state of Illinois to win the singles title four years in a row, 1957–1960, representing Hinsdale Township, which is now Hinsdale Central High School. Tim Gullikson 6–3, 2–2, RET. ^ Pro Circuit – Player Profile – RIESSEN, Marty (USA). ITF Tennis (1941-12-04). Retrieved on 2014-01-21. ^ a b United States Lawn Tennis Association (1972). Official Encyclopedia of Tennis (First Edition), p. 428.